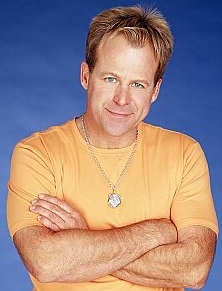 Scotty Baldwin came to Port Charles with his mom, Meg, and half-sister Brooke at a very young age. His mother married Lee Baldwin; he later adopted Scotty and became his father and sole caregiver after his mom died a few years later. Years later, Scotty decided to go to law school and left Port Charles. When Lee returned to Port Charles after the death of his second wife, Caroline, he spent more and more time with Gail Adamson. Gail tried constantly to comfort Lee, and as a last resort she called Scotty to come help his father. Scotty returned and went to work at GH where he met and fell in love with Laura Webber. Scotty and Laura were married in a very small ceremony. Later, their marriage ended in divorce because Laura had fallen in love with Luke Spencer. After that, he left town to get over Laura. He returned to Port Charles just in time to catch Laura's bouquet at her wedding. Even though he’d returned, this was not enough and Laura rode off with her new husband. Scotty and Luke hated each other for many years because of Laura. Since his romance with Laura ended, Scotty had many affairs and romances. In 1982, he married Susan Moore so that he could get her son's trust fund. But he left Port Charles to take a job elsewhere after his father fired him for trying to discredit Luke in his campaign for mayor. He returned to rescue Bobbie Spencer from jail in Florida. A few years later, he had an affair with Lucy Coe while she was married to Alan Quartermaine. Lucy ended up leaving town, and Scott married the love of his life Dominique Stanton Taub. It was later revealed that she had a fatal brain tumor, and they renewed their vows in a tender ceremony in front of family and friends. While they were together, they badly wanted a child and Lucy became their surrogate mother. Scott delivered the baby in a cabin and later rescued Serena from being kidnapped. He then fled to Canada with his child. Scott returned years later to Port Charles and was briefly involved with Lucy again, as well as a woman named Eve (on the show Port Charles), and then also took up with Bobbie again. Scott and Lucy adopted a little girl named Christina, who was kidnapped for a while but then re-appeared. Scott also found out that he was the father of Karen Wexler by an old high school flame, Rhonda. Unfortunately, Karen died in a car accident in 2003. Later, Scott found out that he had a son, Logan. At first he didn't believe it, and he didn't like Logan, but eventually they patched things up. Logan, too, died in 2008. Throughout his history on GH, Scotty has continued to pursue Laura and has become a constant pain in Luke's side. He most often seems to be involved in some scheme, even though he is technical part of law enforcement. It was revealed that Scott and Rick Webber, Laura's father, had a secret that they didn't want revealed to anyone. Rick put in a good word for Scott with high-level public officials, getting Scott on the ballot for District Attorney. As Scott tried to keep Laura from discovering the secret, his behavior looked suspicious to Luke who saw Scott and Rick constantly conferring together. Panicked over Laura's sudden memories and Luke's digging into the past, Scott and Rick dug up a grave in the Scorpios; yard, but a dog ran off with the skull. Scott managed to retrieve it and hide it. But all their actions didn't stop Laura from eventually remembering that, on that night long ago, she had accidentally killed Rick's mistress. When Laura finally remembered this and confronted Rick, he ended up dead. Hoping that Luke was behind Rick's death and scared that Laura was responsible, Scott tried to arrest Luke. When he finally did arrest Luke, he questioned Laura and taped her confession to killing Rick. Scott played the tape for Luke, who agreed to take the rap for a mentally ill Laura. Scott blamed Luke for pushing Laura to remember and causing her mental breakdown. Luke got sentenced to life in prison but was able to escape by tricking Scott into a fight and knocking him out. We always got the feeling that while Scott couldn't stand Luke, he kind of admired him and tried to protect him a lot for Laura's sake. Scott eventually became District Attorney. As D.A., Scott abused his position so that he could go after his enemies: Sonny, Jason, Luke, and later Johnny. Scott always tried to make himself look like a saint in front of the press. Even when Scotty is doing something illegal or nasty, he always has a quirky sense of humor that endears him to people. In his younger years, he was always looking for an angle, a way to get around things. He was very charming as well. Scott often made fun of his hair which, before it receded, stuck out on top. He had a thing for apples that bordered on obsession. Even though he was raised by Lee, who is compassionate and law abiding, Scott seemed to lack a certain sense of morality. He was always getting into trouble with schemes, usually with women like Lucy or Tracy. His children brought out the best of him, and for a while it looked like he had turned over a new leaf. However, running for D.A. seemed to turn him mean. The very worst of his personality took over as he used every dirty trick to run against Alexis. Then he abused his power to go after Sonny and the rest. This lost him Bobbie forever. In 2007, Scott used the Port Charles Hotel fire to escape an Internal Affairs investigation of his wrongdoings by faking his death, and he ran away with his daughter, Serena. He came back to town later after Laura came out of her catatonic state, but she went back in it again. Scott was investigated by Lulu when certain details of Rick's death came to light. She found out that it was really Scott that had killed Rick in Laura's defense. When Laura finally returned to normal in 2008, Scott whisked her away on a romantic trip to L.A. They went back to Port Charles before she headed off to Paris to continue her medical treatments. Scott snuck aboard her plane and that's the last time we saw him.